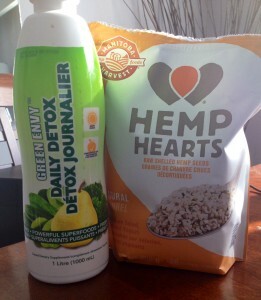 In this week’s blog I am reviewing two products that I use daily – Green Envy – Daily Detox and Hemp Hearts. I will look at the benefits of each and how to use them. These two products each have their own positive impact on my personal health and are really easy to incorporate to your daily routine. I purchase both products in large sizes at Costco. I have seen Hemp Hearts at local grocery stores and Green Envy at Walmart. I am sure that both products can be purchased at most health food stores. I know that eating greens are great for you. I also know that I don’t think I get enough on a daily basis. There are many supplements out there in a powder form that you mix with water to get your daily dose of “greens”. However for me, drinking an entire glass of this turns my stomach. Luckily for me, I found Green Envy! http://agrolabs.com/site/products/green-envy-daily-detox/. The daily dose is one 30 ml “shot”. This I can handle. Does it taste good? Nope! But I have certainly tried worse. It’s tolerable and well worth it for its health benefits. Green Envy is packed with 23 vegetables, fruits and herbs. It also contains superfoods including barley grass, wheat grass and broccoli. It is non-GMO and gluten free. People with higher vegetable intake have lower risks of strokes, diabetes, high blood pressure, certain types of cancers, Alzheimer’s and heart disease. They also have shown to score higher on cognitive tests! So they are brain food too! The variety of hemp hearts I regularly buy are a Manitoba Harvest product http://manitobaharvest.com/… #lovelocal! These raw shelled hemp seeds are virtually tasteless which means you can easily add them to any food or meal. I mix them in with yogurt, toss on top of salads, sprinkle on brown rice, quinoa or your favorite cereal. Do you have any morning health or nutrition rituals? We love spreading the word of health every day and always welcome hearing about your favorite products and services to keep the mind and body healthy.